Brooklynites often get a bad rap. I know this because I lived in Brooklyn for 3 years and consistently got bad raps from old friends. I lived in Greenpoint and witnessed New York Magazine’s so-called Sonic Boom in the fall of 2009. It really wasn’t so much of an explosion, as it was friends casually hanging out with each other and making music. When one friend’s band would get signed to a label, they would do everything they could to help get their college buddy, roommate or significant other signed along with them. TV On The Radio took Grizzly Bear out on tour, Chairlift lent guest vocals to Das Racist songs and a founding member of Amazing Baby left to become the full-time drummer in MGMT. Out of this incestuous madness, Suckers was born. The group honed their skills around NYC staples such as Mercury Lounge, Brooklyn Bowl and Glasslands Gallery until Frenchkiss Records ultimately scooped them up. On Wednesday night Suckers returned to DC to play the 9:30 Club, supporting Menomena. 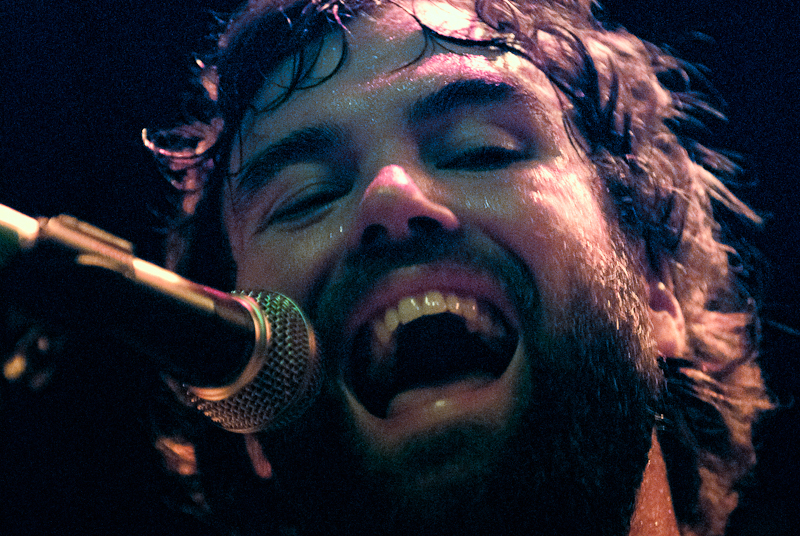 At one point, Suckers lead singer Quinn Walker mentioned that he ‘really felt like they’d worked their way up’ in DC. It’s true. Their first time playing DC, about a year ago, they played at 200 capacity DC9 and the last time they came through they were supporting Local Natives at the 400 capacity Rock N Roll Hotel this past May. This time around, playing in the much larger 9:30 Club, the band played most of the tracks off of their only full-length album Wild Smile to a close-to-capacity room. They started out on a strong note, with heavy percussion and layered samples through a drum pad. The group hit a snag three songs into their set during “Black Sheep” when it seemed that the bottom fell out of their sound. That was the result of a broken pedal on the bass drum and a guitar that had gone out of tune. After fixing the bass pedal and tuning another guitar it took a few more songs for the band to get back into the groove. Once in that groove, they stayed there for the remainder of the set. During the 45 minute performance they breezed through “A Mind I Knew”, “You Can Keep Me Runnin’ Around” and some serious whistling during crowd favorite “Roman Candles”. The band has the daunting task of recreating an album with a very big sound on record during their live show each night. They were able to get close by using a ton of percussion, electronic waves, trumpet and at one point calling out a member of opening band Tu Fawning with a trombone as well. Overall it was an engaging set. Suckers pair the musical noise factor well with Quinn Walkers somewhat silly, yet sincere vocal tone. The band has come a long way since the days of rocking face paint and mega-chains in Williamsburg galleries, but there is still room to push the envelope on the live show. All Photos by the very awesome Eric Uhlir. More after the jump. Brooklyn quartet Suckers premiered a new video for “A Mind I Knew” over at IFC.com on Monday. The above video is for the song “Black Sheep”, a green-screen psychedelic bit. The band released their phenomenal debut album, Wild Smile, earlier this year on Frenchkiss Records and have been relentlessly touring around it. 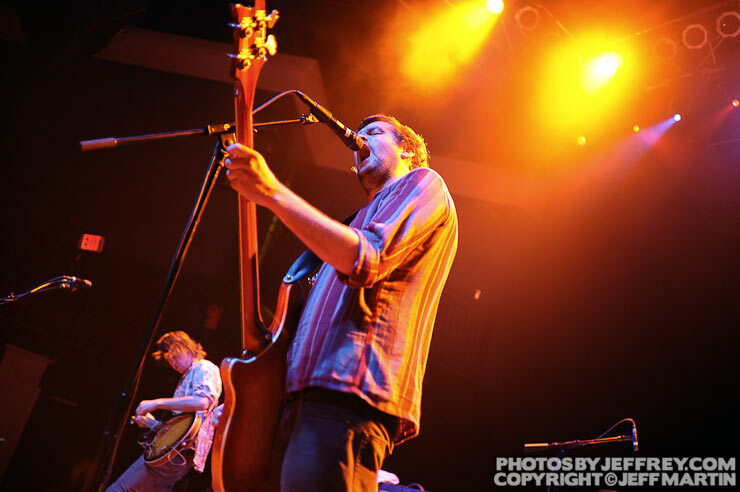 They will be hitting the stage of the 9:30 Club tonight supporting Menomena. Klaxons‘ show at the 9:30 Club with Baby Monster this past Tuesday was long overdue. 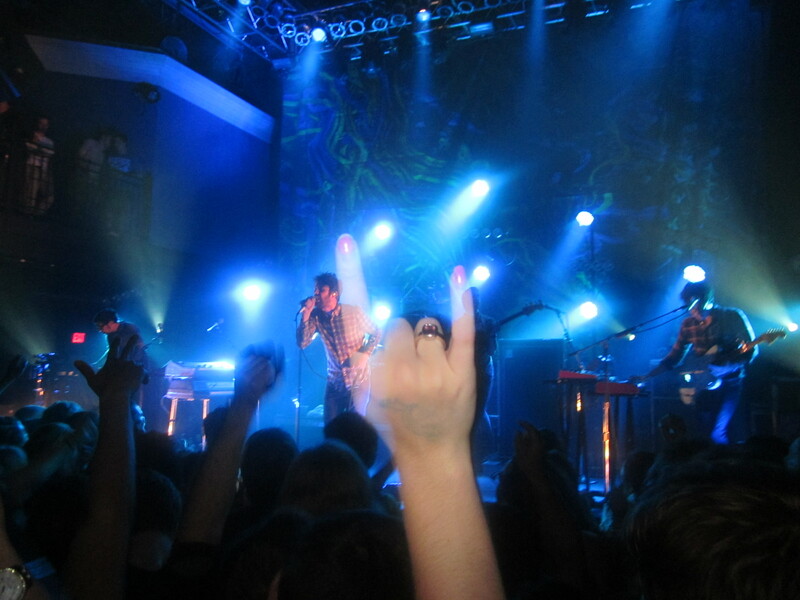 Having sparingly made any live appearances since 2009, this tour was the first chance for stateside fans to catch a glimpse of the band since their rise to indie stardom off of the seminal Myths of the Near Future and in anticipation of the US release of their second album, Surfing the Void. The band split their set pretty evenly between the two albums. It was nice to hear live renditions of Surfing, especially given that the band was forced to re-record it after being told by their label that the album was too experimental. Although the final result is far from inaccessible, you could get the sense at the show that the band’s latest work is a bit darker and more psychedelic than their older material. That is, until they exploded into “Echoes,” the first single off of new album and perhaps my favorite Klaxons track yet. Although the show was a great exhibition of Klaxons’ new material, it was also a powerful reminder of how amazing Myths of the Near Future was. It’s unbelievable how many amazing tracks were packed onto that album. There were no glaring omissions in their set list as Klaxons powered through the record’s best, including “Golden Skans,” “Gravity’s Rainbow,” and “Two Receivers.” The highlight of the show (aside from the Peace Walker) was the closer, “Atlantis to Interzone.” The raucous new-rave anthem set the room on fire and brought a pleasant end to what had been an amazing night. Special thanks to Jeffrey Martin for taking these awesome shots of the show, the rest of which you’ll find after the jump. Marina Diamandis, better known by her stage name Marina And The Diamonds, is a very confident 24 year old. She took the stage Monday night at the 9:30 Club in DC to a near capacity crowd. She exudes personality and style – occupying a space somewhere between Amanda Palmer and Lilly Allen. She’s got the vocal chops and intensity of the former with the charm and accessibility of the latter. Marina blew through most of her debut album The Family Jewels and a couple extras in an hour-long set, engaging the crowd for the duration. There were several costume changes, some great props and a strangely appropriate piano ballad cover of “STARSTRUKK” by 3OH!3. Highlights of her own material included “Shampain” and electro-tinged hit single “Oh No!”. She had a great live band behind her with a very tight bassist, plenty of synth and hard-hitting drums. People are quick to assume that The Diamonds are her backing band, but Marina ended the show with “Mowgli’s Road” and proclaimed to the audience “I am Marina and YOU are the Diamonds”. More pictures and a brand new video for “Shampain” after the jump. The Drums, comprised of core songwriting duo of Jonathan Pierce and Jacob Graham, have had a couple of novel ideas over the past few years. #1 was to move from Orlando, Florida to Brooklyn. #2 was to relocate from Brooklyn New York to London – Brits love anything that reminds them of Joy Division and The Smiths. #3 was getting a video endorsement from Boy George that ‘mysteriously’ ended up on NME’s website. #4 was to release a very danceable, whistle-friendly homage to hitting some waves – listen to “Let’s Go Surfing”. Their most recent flash of genius involves playing the 9:30 Club in DC on September 12th with fellow Floridians (and beach dudes) – Surfer Blood. Last Thursday, I luckily got the chance to see two of my favorite bands (and another that I’m beginning to fall in love with) at the 9:30 Club here in Choc. City; Passion Pit and Tokyo Police Club (and DOM). More accurately, I should’ve seen DOM, but Pork Slap Pale Ale and Moo Thunder Stout delayed my arrival until part of the way through TPC’s set, missing DOM altogether. The boys from Ontario did not disappoint, playing a nice balance of songs from A Lesson in Crime, Elephant Shell, and their newest effort, Champ (which we discussed here a few days ago). TPC was their typical high-energy self, finishing up with a particularly passionate version of “Nature of the Experiment,” which set the stage nicely for one of the best performances I have seen in a few years. If you haven’t noticed yet, writing concert reviews is not my forte. I wrestled with the idea of just posting a few photos and a jam for you in lieu of an actual review, but the show put on by Passion Pit last week was so mesmerizing, I had to at least try to put it into words. They played EVERYTHING off both Chunk of Change and Manners, save for “Seaweed Song” and “Cuddle Fuddle” with such infectious vigor that I couldn’t contain myself. In fact, it got passionate (zing!) enough that my main bro Matt’s clothes couldn’t contain him (see epic bro preparing his best Petey Pablo impersonation). I had seen PP last June right after the release of Manners, and, while the show was entertaining, it was clear that the group needed to refine their live sound. Well….they did, in a big way. After lead singer Michael Angelakos informed the raucous crowd that he had heard that D.C. concert-goers didn’t dance, the mob responded with an hour of constant raging the likes of which D.C. hasn’t ever seen. But wait, there’s more. They returned for an encore, playing “Let Your Love Grow Tall.” Then, the most amazing thing happened. I heard a few chords of what I assumed was a cover, and all of my friends began to look at each other. We all immediately realized that we were about to be blessed with one of the sweetest covers of The Cranberries “Dreams” ever, and that’s meant to be a compliment. The fact that the band had every single dude in the crowd singing “all my life, is changing every day” in falsetto and screaming the chorus of ooohs is a testament to the electric atmosphere running through the club that night. After finishing with a explosive version of “Sleepyhead,” the band waltzed off stage, leaving an adoring crowd in absolute shock. I was a sweaty mess, and I’m pretty sure I still haven’t recovered. Check out the studio version of their cover of “Dreams” which I only discovered after the show, as well as some sweet pictures of the show after the jump.